This tutorial walks you through creating a new game project. 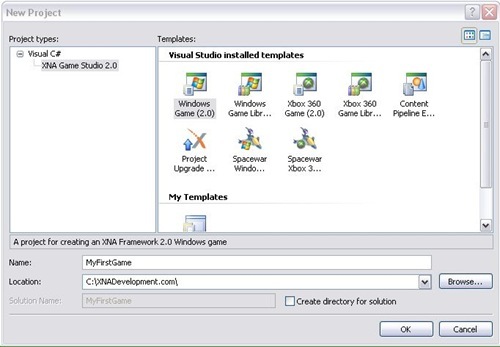 To create a game with the XNA framework, we first need to create a new Windows Game Project. Creating a new game project is how all new games will start out. The first step in creating a new game project is launching XNA Game Studio Express. Once XNA Game Studio Express has loaded, navigate to the menu and click on "File" and then select "New Project" from the menu drop down. This will open the "New Project" window. In the New Project window, expand the Visual C# tree on the left. Now select XNA Game Studio 2.0 from that list. On the right, you'll see some installed templates. Click on the "Windows Game (2.0)" template to select that template for your project. Next, type the name of your game into the "Name" text box and choose a location to save your new game. Finally, click the "OK" button to create the new game project. XNA Game Studio Express will create all the necessary directories and files a new game project needs. The new project will also open in the XNA Game Studio Express IDE waiting for you to start coding your game. Now that you have created your new game project, let's stop here and do a quick build . This is a good habit to get into. 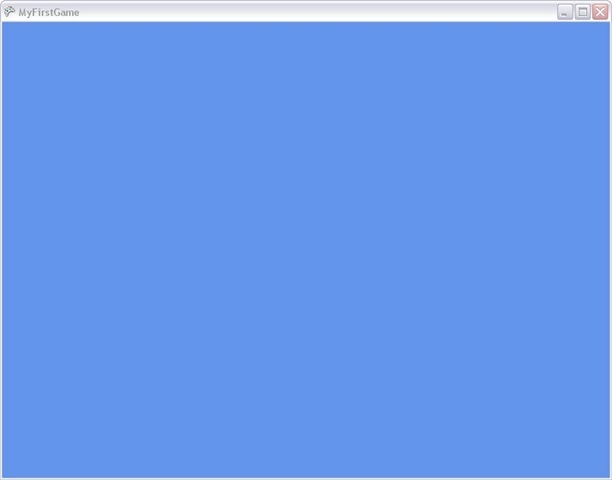 Not only does it show off the power of XNA (can you believe you can already render a solid color to the screen already! ), but it also helps to verify that the project was created correctly and that the PC you are developing on has a video card that supports the minimum requirements for XNA. If you don't get the expected results and you have an error, then your video card most likely does not meet the minimum requirements for XNA. Check out the XNA FAQ from the Microsoft site for a complete list of minimum requirements for the XNA framework. If you are meeting the requirements for the XNA framework and are still getting errors, then I recommend you head on over to the Creator's Club XNA Forums. First do some quick searches around the forums just in case someone else has already encountered the issue and a solution has already been provided. If you can't find anyone else with the same issue, then create a new post and describe the error or behavior you are seeing. The XNA forums are full of very helpful folks (you will probably see me around there, I find them to be a great place to hang out) and you are sure to get some advice very quickly from some very knowledgeable people in the XNA community. You can now successfully create a new XNA Windows Game project. Armed with this knowledge, you're just a hop skip and a jump away from making your own game. Go play a little. Look through the code in the new game project and see what happens when you change some things. Do you see where the code is telling the game what color to render to the screen? Try changing it! Now take what you know and build off of that. Explore other XNA sites in the community and see what else you can learn. Start with the basics and move up from there. Most of all, make sure that you are having fun!